This was another gift from my friend Gene. I did not know Guinness had a black lager. This should be an interesting review. The beer pours a dark brown almost completely opaque with just a hint of amber hues showing at the bottom of the glass. This beer also produced a fairly rich tan head. The nose is modest with dark toasted malt aromas. That’s a nice drinkable black lager. That first sip was a smooth as porter ale not a typical black lager. This may be very interesting indeed. The taste starts out with a dark malt sweetness up front but that is followed by a cleansing effervescence over the tongue in mid-sip. The back end is very easy drinking with an effortless swallow. The carbonation release during the swallow adds a refreshing aspect to the beer and masks some flavors. The finish is modest but very pleasant with nice dark toasted malt flavors along with a subtle hop finish. The finish is surprisingly dry for such a dark beer. There is very little of a final aftertaste just some lingering toasted malt flavors. This is a very smooth and refreshing beer. I’m really quite surprised on how good it is. It may be too light and refreshing for the style and will probably not get good reviews. But it has been very enjoyable to me so far. Finally I’m starting to pick up some more robust malt flavors as this beer warms and opens up a little. I let this get to room temperature and it has not picked up any unpleasantness whatsoever. Actually I’m impressed with how good it still tastes. I’m going for an A- on this one. 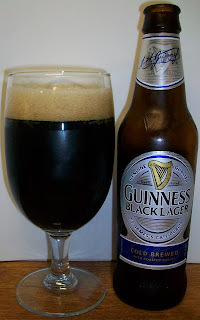 This was a very impressive black lager, very refreshing with nice dark toasted malt flavors with a clean finish. I went back and looked at my previous black lager reviews and it looks like this was the best so far.